Primates, mammals, birds, flora and fauna beyond your wildest dreams, Uganda safaris are like no other. Experience an off the beaten track adventure, full of discovery for travellers looking for the unexpected. Of course the gorillas are a highlight, but there is so much more that this hugely diverse country has to offer. 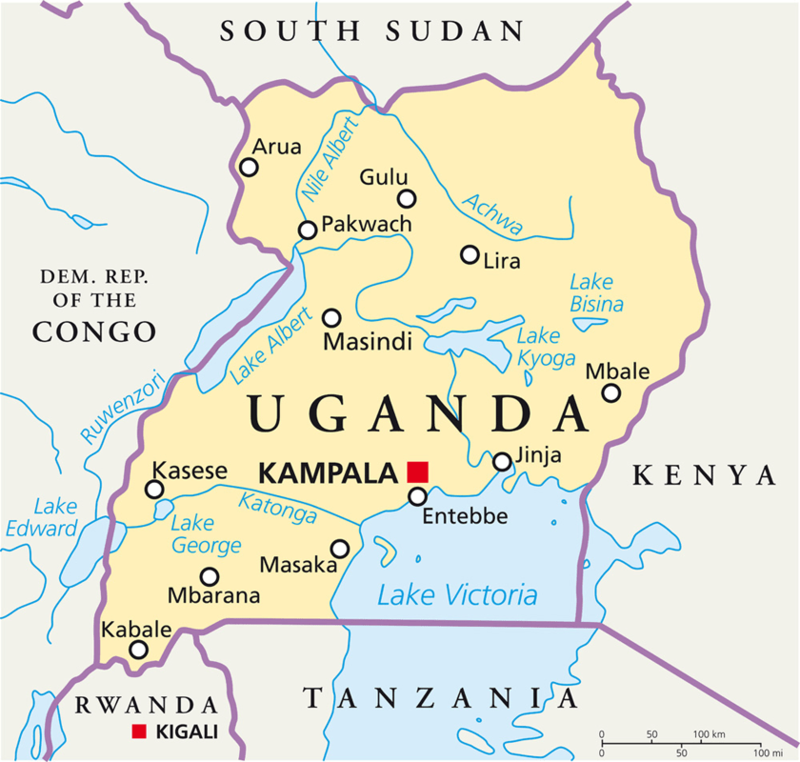 Uganda straddles the Equator between the eastern and western branches of the Great Rift Valley. With a high rainfall, unsurprisingly 25% of its surface area is made up of lakes, streams and rivers. Its lush rainforests, savannah and semi-desert areas are inhabited by a prolific variety of animals and birds. Perhaps the most famous inhabitants are the Mountain Gorilla (currently six habituated groups) in the Bwindi Impenetrable Forest. A few hours spent watching these gentle giants play, eat and groom each other is a very memorable and incredible experience. Stay at a lodge at over 2,000m above sea level with beautiful panoramic views of the Virunga Volcanos and the Great Rift Valley. Find over 560 species of bird and mammals from primates to small antelope, as well as nocturnal animals such as bush babies, genets and civets. From Bwindi, one can walk north through the forest to Queen Elizabeth National Park. Be on the look-out for unusual species such as the forest guinea fowl and mongoose. The Queen Elizabeth National Park is characterised by open savannah dotted with acacia trees and lakes. It lies between Lakes George and Albert, which are linked by the Kazinga Channel. A highlight is a cruise on the channel to see hippo, elephant and waterbuck at close range. The birdlife is incomparable, from whiskered terns and skimmers to a myriad of different kingfishers and waders. Kibale National Park slightly north of Queen Elizabeth, has a concentration of 11 species of primate in its lush forest. Guided walks in the forest reveal black and white colobus and red-tailed monkeys. Chimpanzees have been habituated and can often be seen high up in the canopy, moving their nests each day. Semliki National Park on Uganda’s western border is the oldest protected area in the country. Bordered by the foothills of the Rwenzori Mountains (the Mountains of the Moon) and Lake Albert. Its relative remoteness has helped preserve the park’s integrity and, maintain the magical forest that is home to an habituated chimpanzee community, as well as over 425 bird species. Boat trips on the lake are well worth while as you get a different perspective of the surrounding landscape and you are regularly rewarded with great views of the slightly pre-historic looking shoebill storks, that are very sparsely distributed in Eastern Africa. Other wildlife to see are the forest elephant and savanna elephant, Ugandan kob antelope, monkey and buffalo. Murchison Falls is Uganda’s largest park, renowned for its scenic beauty. You can take a boat trip to the famous Falls where the Nile squeezes through a tiny eight-yard (seven metre) gap. Kidepo Valley National Park is situated in northern Uganda on the border of Kenya and Sudan. It is a truly stunning park, with rugged mountains and vast plains that is home to a very good concentration of game, especially good for cats (it is the only park in Uganda with cheetah) and huge herds of buffalo. Birding is incredible here with over 460 species including 58 types of raptors. Overnight in a lodge situated on a on a kopje (beautifully shaped huge rocks) and wake up to a vast cinematic view of a wild and remote Africa, with rarely another tourist in sight.